The filmmakers behind the new animated feature Horton Hears a Who have created a sumptuous looking movie, however, they seem to have missed the mark when it comes to their intended audience. Which is to say they never quite master the great cartoon juggling act which involves enough silliness to keep the little ones interested and enough smart and clever dialogue and plot to satisfy the parents. Here, it seems, there are times when anything happening on screen beyond the visual is going to go right over the children’s heads while at other times, the film plays like bad Saturday morning fare – and there’s really very little crossover. The plot is right out of the Dr. Seuss book of the same name. 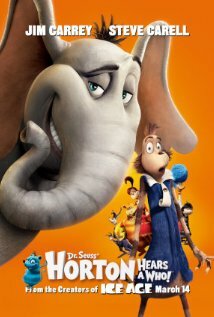 The Whos of Whoville, who live in a speck sitting atop a clover, are saved from destruction by Horton, a simple elephant who believes “a person’s a person, no matter how small.” The general conflict comes in the form of Kangaroo, who believes that if you can’t see, hear, or feel something, then it doesn’t exist. She also has a personal thing against Horton, who is teaching the kids to use their imaginations. So naturally, when Horton starts talking about an invisible world inhabited by people only he can hear, she takes great umbrage and rallies the whole jungle against him. A lot could be made of this, from religious allegory to modern political reform, but it never goes that way, not even for the adults. Instead, the script, by Ken Daurio and Cinco Paul, just skims the surface. There are some lessons to be learned, certainly, but parents are going to have to pull them out of the context in order for the kids to really benefit. That said, though, my seven year old niece loved the film. She was caught up in the story of the tiny Whovians having to scream loudly at the end in order to be heard and save themselves from being dropped in boiling oil (like I said, a lot could be made with political metaphor here). But even with her enjoyment, she still felt there were scenes which were a little scary and intense. When Kangaroo hires a vulture to attack Horton and destroy the speck, that vulture is a right nasty villain, complete with razor sharp teeth and talons and the threat of death seems rather real and yet it comes right out of left field. Again, there’s no thought to the who the audience is and what their expectations are. So this is not a film to drop the kids off at while you go shopping, but as long as you’re there to keep an eye on them, and explain the scary bits, they should be just fine. With all that, what is there to recommend the film? The artwork is beautiful! The animation is subtle and supple and varies from the 3D computer generated stuff we’re used to seeing to more traditional “flat” animation when we see inside Horton’s head. The voices are also top notch. Jim Carrey gives a Horton a varied vocal range Robin Williams can only dream about. He doesn’t overdo the different voices and dialects, using them in harmony with the story. Additionally, Steve Carell as the Mayor of Whoville is first rate, wringing some nice emotion out of a purely aural performance. But the cake goes to Carol Burnett who provides the voice for Kangaroo. Burnett, like all classic actors, makes us feel empathy for the character we want to hate and when she does finally come around (come on, like you didn’t know that was going to happen), Burnett lets us forgive her. In the end, this isn’t a perfect movie, but it’s serviceable. And it will hold the kids until June, when the newest Pixar release hits the big screens.